Domingo Carles, Barcelona (by 1932). Barbey Collection, Barcelona (by 1950). Anon. sale, Sotheby's, London, 28 June 1988, lot 22. C. Zervos, Pablo Picasso, Paris, 1932, vol. 1, no. 54 (illustrated, pl. 24). A. Cirici-Pellicer, Picasso avant Picasso, Geneva, 1950, no. 63 (illustrated; with incorrect dimensions and support). A. Blunt and P. Pool, Picasso: The Formative Years, A Study of His Sources, London, 1962, no. 102 (illustrated). P. Daix and G. Boudaille, Picasso, The Blue and Rose Periods: A Catalogue Raisonné, 1900-1906, London, 1967, p. 46, no. VI.3 (illustrated, p. 193). J. Palau i Fabre, Picasso: The Early Years, 1881-1907, New York, 1981, pp. 274 and 536, no. 690 (illustrated, p. 274; titled Scene in a Public Garden and with incorrect support). The Picasso Project, ed., Picasso's Paintings, Watercolors, Drawings and Sculpture: Turn of the Century, 1900-1901, San Francisco, 2010, p. 182, no. 1901-261 (illustrated; with incorrect support). Paris, Galerie Berthe Weill, Exposition de peintures, pastels et dessins de MM. Girieud, Launay, Picasso et Pichot, November-December 1902, no. 4 (titled Luxembourg). 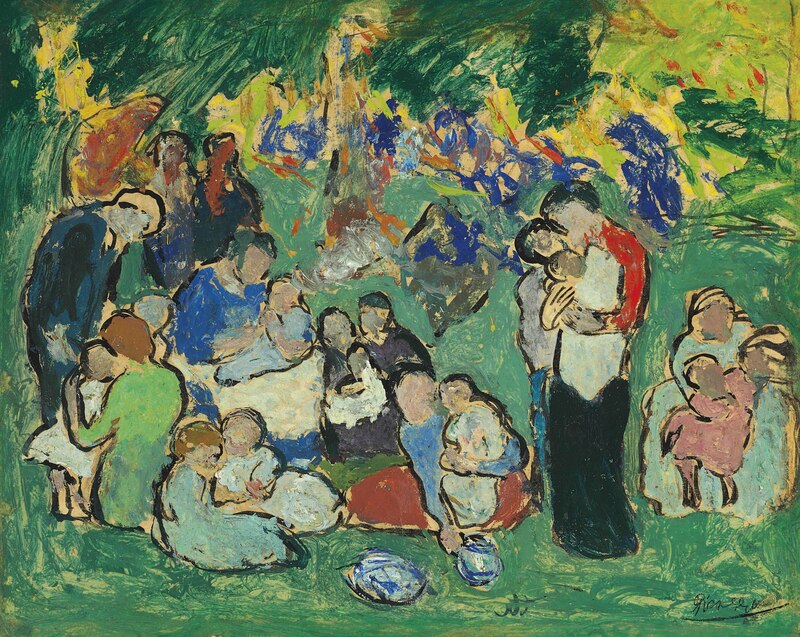 Picasso painted Enfants dans le jardin du Luxembourg during the spring of 1901. Picasso's youthfully impetuous handling of this scene, with the paint laid on thickly and on the quick, gives the impression of real life caught on the fly, and generates a sense of freshness and spontaneity that well serves his presentation of this subject, while avoiding many of the typical maudlin sentiments that have accrued to the depiction of children, and the mother and child theme, in art. He was especially eager to prove himself during his second foray into the Parisian art world. Mañach had arranged a timely opportunity for Picasso, an excellent break for a talented unknown in Paris: a show of Picasso's work was scheduled to open on 24 June at Ambroise Vollard's small gallery on the rue Lafitte. Picasso had plenty of work to do, for he had brought only about recent twenty paintings and some drawings with him from Barcelona. He needed many more to fill up Vollard's gallery space. Mañach encouraged his protégé to cut back on making paintings of prostitutes and other low-life subjects of street life to which the young man was normally attracted, and to try his hand at more appealing and salable genres, such as views of Paris, fashionable crowds at racetracks, still-lifes and scenes with children. The deadline of his June opening had him fired up, and he found himself on a roll. He made no effort to hide the haste in his paintings--the feverish application of thick, buttered-on oil paints betokens the great measure of pride and self-confidence the artist felt in his skills, and he was unabashed at showing them off. This, after all, was the whole point of the upcoming gallery show, to make a strong impression, and attract notice. When the exhibition opened on 24 June 1901, sixty-four numbered entries of paintings, pastels, watercolors, and a large group of drawings lined the dealer's walls. Picasso certainly made good on Mañach's suggestion that he feature children in some of his new pictures. This theme, in fact, became a significant thread that runs through the Vollard exhibition pictures; while not quite so striking as the dance hall queens and other demi-mondaines that were intended to titillate the public eye, their presence is felt as a noticeable, if somewhat unexpected diversifying element in Picasso's efforts to become a painter of modern life. Christian Zervos, Pierre Daix and Georges Boudaille, and Josep Palau i Fabre together illustrate as many as a dozen and a half paintings done during this time which have children in them. A few like the present painting feature children in various outdoor settings. The inspiration for these works probably came from Bonnard, Vuillard and the Nabis painters, who often included children in their intimiste depictions of Paris family life. Unlike the Nabis, however, who were in close touch with their bourgeois milieu, Picasso during this period had little time for--or, with his bachelor bohemian life-style, and as a poor foreign visitor to Paris, hardly any access to--situations of proper bourgeois domesticity that he might experience firsthand and put into his paintings. But children were everywhere to be seen in Paris, on the trams, in shops and especially in public parks, in the care of their mothers, nursemaids and nannies. One of Picasso's contemporary sketchbooks, designated Carnet 99 and ascribed to 1900-1901, contains numerous studies of children at play that Picasso made outdoors in public places. Picasso suddenly took notice of children, just as he was struck at once by the public displays of affection among couples during his first trip to Paris the previous autumn. Picasso's exhibition at galerie Vollard ran until 14 July. It had turned out well for the young painter, who wrote to his friend Vidal Ventose on 13 July: "My exhibition in Paris has had some success. Almost all of the papers have treated it favourably, which is something" (quoted in M. McCully, ed., A Picasso Anthology, Princeton, 1981, p. 35). John Richardson has written: "The Vollard exhibit was a stunning bravura performance for a neophyte, and it included some brilliant tours de force. Mañach's insistence on salability paid off: the show was not only a succès d'estime; it was, in a modest way, a financial success. Well over half the items sold" (A Life of Picasso, New York, 1991, vol. I, p. 199). Please note the correct medium is: oil on paper laid down on panel.